The major culprit in almost all of the big lower elevation fires in the interior West is cheatgrass, which has a nicer name of downy brome (Bromus tectorum), probably given for the way it is during the brief period is it growing, green, and not ripening. Cheatgrass has taken over the West, greatly increasing fire danger, damage, and harming wildlife habitat, causing stream erosion, etc. Global warming or not, there will be more and more fires as cheat grass spreads because that is a major way it wipes out its native competitors — fire. It is an annual grass, and it is the first grass to sprout with late summer rains. It usually gets a good start before winter and continues in the early spring. If the autumn is dry, it sprouts in early spring. It is very shallow rooted, sucking the up moisture and nitrogen that native seeds need to sprout as well as shading them out. Cheatgrass is a tremendous producer of seeds, far exceeding native bunchgrasses. Once it starts to move in, almost always as the result of some disturbance that creates bare ground, it is almost inevitable that it will convert most of the area into dry brown grass for most of the year, replacing semi-arid country shrubs and native grasses with a dreary monoculture. This will happen slowly if there is no fire, but with a fire it is almost inevitable and the annual probability of a fire increases with the proportion that is cheatgrass. I took this photo of a tall perennial bunchgrass (Great Basin wild rye) and cheatgrass near Pocatello, Idaho in early July. To the casual observer it might seem the wild rye is doing great (it’s tall and green even though it was been half eaten by cows) and the cheatgrass dry and dead, but the wild rye is doomed even without a fire. That is a terrible thing because wild rye has very deep roots to seek out water in mid-summer, and these roots serve to hold the soil in place. Cheatgrass is only slightly better than a slope of bare soil. I can’t tell if the cheatgrass was grazed before it ripened or not because it goes to seed even if cattle or sheep are put in to eat it during its brief “downy phase.” It can’t be eaten when it is ripe like in the photo because the seeds are very hard and sharp (you’ve probably gotten it in your socks — itch!). Perennial bunch grasses can’t stand heavy grazing. If the rest of that green wild rye is eaten by a cow, it will be so weak when it sprouts next year that it will probably be overrun by the cheatgrass (no fire necessary). The wild rye’s seeds don’t have much of a chance sprouting in the cheatgrass, and cows have already chomped off all but one seed stalk on this bunch anyway. Cheatgrass begins to invade an area most often by dirt roads or vehicle tracks, usually in conjunction with cattle grazing. Heavy grazing leaves bare spots, and the first seeds to sprout on these bare spots will be cheat grass once an infestation is nearby. The cattle also spread the cheatgrass seeds and trample them in, for good measure. Overgrazed range (sagebrush steppe) with all the native grass eaten. Bare ground, the perfect spot for cheatgrass to sprout and then soon burn, destroying the sagebrush which has already been weakened by cattle trampling. This photo in the Owyhee country (BLM) of SW Idaho was taken this year (2007) by Katie Fite. A fair portion of it that has been invaded by cheatgrass has burned this year. More information. Cheatgrass: the Invader the won the West. That is a serious problem. I think I’ve seen it around here but I’m not sure. Unfortunately, it won’t get better until.. This is why I am motivated to act. It is a disaster that’s coming. It’s pretty obvious isn’t it? KT or anyone with knowledge about noxious weeds…. ..Seems the preferred treatment for noxious weeds(knapweed, leafy spurge, houndstongue etc) in my area is to spray with “tordon” and or “milestone”, then follow up with sheep to finish whatever weeds are left. Does this open up the possibility of an invasion of cheatgrass? Weeds thrive in areas of disturbance in wild lands – just like in the margins of a garden. 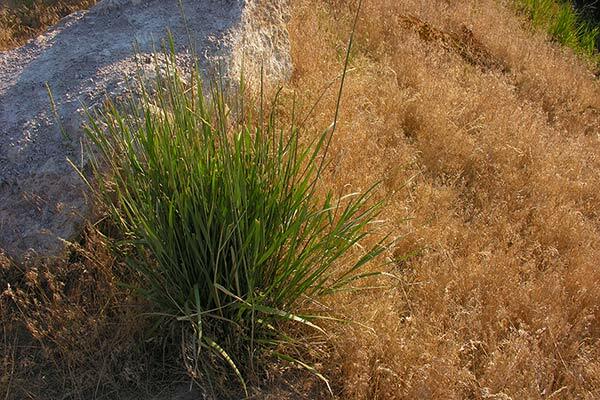 Unless you get perennial vegetation established on the sites where you have sprayed Tordon, and/or trampled and grazed with sheep or goats – it certainly does open the door for cheatgrass/brome or other weed invasion. Maybe BE, who I believe has a horticulture degree, among other talents, has some insights on Tordon, its persistence, and ecological effects? I’ve seen areas in the Lost River Valley on BLM lands in the Antelope Creek watershed where an obvious herbicide event had occurred, and all the tall Basin big sagebrush and native grass had been killed, and the ONLY thing surviving and thriving was the leafy spurge. 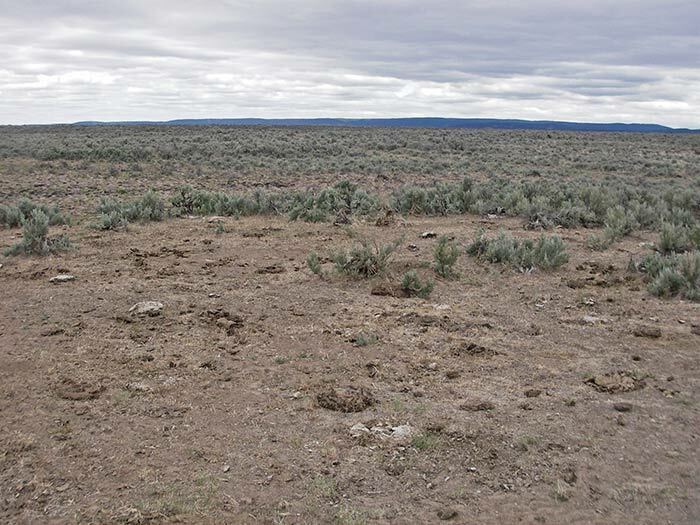 And sites in northern Nevada where ALL the remaining sagebrush, roses and mesic vegetation at the margins of cowed-out springs and seeps had been sprayed – dried skeletons of shrubs left – and the landscape a couple years later was a carpet of cowpies and white top and cheatgrass. And the sheep and goat grazing? Perhaps it will knock weeds back in the short-term, but unless you alleviate disturbance to the site and establish perennials and intact microbiotic crusts – the weeds will be back. The policy being followed on our public lands is basically a dis-integrated, instead of “integrated” weed mgmt strategy. Spray and walk away. Sheep and retreat. Right now the comment period is open on a Final BLM Westwide Weed EIS – where the BLM continues its disastrous policies tha are leading to all the cheatgrass-fueled fires. BLM’s solution to weed/fuels problems across the western states is aimed at enriching Monsanto and Dow Elanco, and more of the same old Bush Healthy Forest “fuels reduction” projects. AND the BLM Weed EIS provides NO honest effort whatsoever to address the role of livestock grazing and trampling in promoting weeds. The only thing that seems to matter is the big government contracts the chemical companies will get. the important thing to understand, from my perspective, is that disturbance of the soil is the enemy here. the best defense against weed infiltration is intact and healthy native communities and the microbiotic soil crusts which takes years to develop in arid conditions. that’s humbling. the tendency of BLM is to solve the problem with anthropogenic force. there must be a “treatment”. unfortunately, especially in the case of cheat, is that the “treatments” prescribed are egregiously aggressive with our landscapes (prescribed burn then spray then burn – or the like). these aggresive treatments are very disturbing and as such, there is no chemical in this world that can be laced across our children’s public land and water supply that will prevent the weeds from outcompeting on these new swaths of landscape – especially when grazing is a given variable. in fact, rarely are the real costs of spraying considered. does the spray sterilize the soil and remove necessary soil conditions for natives (ex: mychorrizal communities which promote native germination, vigor) – the soil itself has much life – a metabolism – nutrient levels, the conditions natives evolved in conjunction with, are altered when chemical salts are laced. weeds are another externality cost of the livestock industry — bladed roads only “necessary” to subsidize permittee access to an allotment. water developments/pipelines tearing up the soil and providing venues for weed seed, and then the cattle themselves – churning the soil and altering native vigor, inflating nitrogen levels (which weeds are able to benefit from but not as much natives), and directly transporting seed on site – but also from where-ever the bovines were trucked in from. i own land in AZ adjacent to a state allotment – you should see the mesquite spread down there – it ain’t natural. spraying is a way of making the externality costs of livestock production on public lands less visible – they’re kicking the can into a less visible realm. they use the industry science in their risk assesments. they test in vaccuums (i.e. they don’t assess active ingredients toxicity in conjunction with the surfactants – or the baseline chemical levels – the toxicity of the chemical’s degradates, or the transformational products). they develop anecdotal programs on plots which aren’t grazed, and then project that level of efficacy for their programs onto public lands that will be immediately grazed (disturbance once again being the aggravating factor in weed infestation). they re-seed treated lands with plants more palatable to cattle rather than with the native communities which if given rest/retirement have the greatest chance at resisting re-infestation – or at least promoting the vigor and actual natural habitat for wildlife. i guess the point i’m trying to make is. if agency attempts at mitigating weeds is to be made – DO SO IN GOOD FAITH – be willing to mitigate the causal contributions – not just treat the symptoms. Cheatgrass is worse and worse here in Montana, particularly in the last couple years. We have treated areas of spotted knapweed with Tordon that are now solid cheatgrass. If it is present, it will fill in the gaps. One solution might be naturally-occurring plant pathogens as are being tested to control Canada Thistle and Yellowstar Thistle. But the real best way to control is by mitigating causal contributions as be said. An large monetary investment in the restoration of native vegetation plus the elimination of livestock needs to be be made in places where cheatgrass has taken over or is invading. Onf of most important things that can be done is to restore beaver to degraded streams, assuming there are still willows, cottonwood, or aspen for them to work with and eat. Expanding the green zone around streams and raising the humidity serves as a fire break. Thats what beaver ponds usually do. I think 10-billion dollars of the right kind of investment would pay for itself in reduced fire fighting costs, improved fish and wildlife habitat, and reduction in mosquito habitat (think of West Nile virus). Of course, they could easily waste the 10-billion by doing what BE refers to above. As an example, they need to restore blue bunch wheatgrass, not blue bunch wheatgrass cultivars or non-natives such as crested wheatgress and its cultivars. Ralph, what are you talking about when you differentiate between “blue bunch wheatgrass” and “blue bunch wheatgrass cultivars” and why is one better/worse than another in your view? I’m not necessarily challenging you; I’m asking honest questions. Please be as specific as you can spare the time to be and answer quickly because I use several types of blue bunch and related species (Granite Seed out of Lehi) and this year’s shipment is on the way any day now. I’m assuming that you consider P7 to be a cultivar; but, what should I be worrying about? I started with the leftovers of someone else’s horrific overgrazing and it has sure jumpstarted the recovery, with western, slender, and even thickspike now moving in. I understand about not using non-natives, but am less clear about the subtleties between a native and a “cultivar” of a native. I’m not a great expert on blue bunch wheatgrass, so maybe KT will chime in here, and you know more about it than I do, but here is what I am thinking. If we are going to try to restore a site to various native species, we should use the native plants that grew on that site or a similar site. A cultivar is, as you know, is a plant that has been selected for certain characteristics and bred to express them. From what I understand many of the blue bunch seedings in burned areas or otherwise “treated” areas are of cultivars that grow taller than the unmodified grass. If you plant these, you may get more forage from the cultivar, but you are obviously thinking about livestock grazing rather than fire reduction. Any wheatgrass is better than cheatgrass, but they will burn late in the summer. A taller wheatgrass will burn hotter than a shorter one. So, what I was trying to say not to plant cultivars that are designed to enhance livestock grazing. Use the native seed if it is available. Yes, commonly available “cultivars” like Secar which is sold as bluebunch wheatgrass but really is not a bluebunch, have all spent many years being bred by Ag. Range researchers to be bigger coarser, more – essentially – “aggressive” than the typically shorter, less coarse native bluebunch wheatgrass ecotypes. Towards the end of this link, http://plants.usda.gov/plantguide/pdf/pg_pssp6.pdf you can see that Secar is not even the same Genus as native bluebunch wheatgrass. It was bred to make it produce more “forage” = and this results in more “fuel” – especially when agencies like BLM plant it in dense rows like a farm field. Then, when you get this super-grass that is not really a native planted on “range” land in places like the Jarbidge BLM lands- you begin to see that, similarly to the Asian crested wheatgass and Siberian wheatgrass, cows don’t like it very much. They eat all the other things first – yet BLM sets its measurements of how much “use”/utilization has occurred on the tallest, biggest grass – the cultivar. So then the stocking rate of cows remains high, and the interspaces get trampled – and overrun with cheatgrass, bur buttercup and other weeds. And no one really knows how pollen from cultivars might cross with native bluebunch remaining on the site. Mikarooni – Is your place grazed? Ralph and kt, thanks. This is good information; I’ve been so fixated on eliminating bare ground that, as long as the plant books/maps say that the species is native to my general area and elevation, I’ve used it. I’ll be more careful and double-check in the future. I haven’t used Secar directly; but, it’s likely that it’s part of the P7 mix that I have used. I do hear what you are saying about different people, including some in BLM and NRCS, not being perfectly clear on what is and isn’t native. One range specialist recommended paiute orchard grass and, when I asked him, a few times in a row, whether it was native, he told me “of course it is; it’s paiute.” It’s really frustrating to be trying to get things done and have to spend time doing your own research because you have to suspect and personally validate every piece of information. I know; whine; whine. Yes, I’m afraid my place is grazed; forgive me. My objective is the value of the property and restoration is an important part of my business plan; but, a rested allotment is a contested allotment and, without livestock, I would never have been allowed to fence out the ORVs that, combined with the previous overgrazing, had just flat stomped the place by the time I got it, which is why the price was low enough to enable me to sell my other holdings and get it in the first place. So, without the political connections to be allowed to raise bison, I raise registered longhorns, which drives the range management guys crazy, and, surprise, surprise, I actually still make money. I do keep my stocking rates way down, which also confuses the range management guys, and, left to range where they want, which is everywhere, longhorns behave like bison in that they are always on the move and don’t stay in any one spot long enough to make a hole. I also don’t have much problem with them being selective eaters. Whatever comes up out there, including cactus, juniper, whatever they have been selling me as blue bunch wheatgrass, and even the smaller twigs and bark off downed pine branches, they eat it all. They even actually seem to like whatever sporobolus species I have out there. So, except for Canadian thistle, which I try to kick out before it gets to seed, I haven’t had problems with invasives yet, knock on wood. My main fire concern is my overgrown woodland and forest areas. I understand that fire is a good thing; but, also understand that blackened property does not hold its scenic value. So, I’m leaving my trees much too dense to please the range management guys, but still making and hauling firewood as fast as I can, using the continuing presence of owls and other birds as an indicator. Hi mikarooni, I think this is a invaluable insight for all of us into the troubles you face. Highly interesting! Global warming processes act synergistically with cheatgrass – the hotter and drier it is at middle to higher elevations where cheatgrass may not yet have a foothold or dominate, the more likely it is that cheatgrass will be able to become established and spread in areas of disturbance there. Here are the states where it is a major problem: Washington and Oregon East of the Cascades, Idaho, Nevada, Utah – and increasingly Wyoming. Other annual bromes, closely related to cheatgrass are now causing large fires in the Sonoran and Mojave deserts of Arizona and California – the saguaros and Joshua trees may be converted to annual brome weedlands – due to the disturbance-brome invasion-fire cycle – just like the depressing landscape of much of the Snake River Plain these days. So in the face of these impending catastrophic losses of whole ecosystems, what are the scientists of the Bush Admin. doing? Frittering away precious time and energy in devising ways (such as the 10j Rule) to slaughter more wolves – and make life even easier for the public lands livestock industry – where the trampling hooves of cows and sheep are priming tens of millions of acres not yet invaded by cheatgrass or bromes FOR cheatgrass dominance – and eventual loss of nearly all native wildlife – and to just ugly, nasty places to hike, camp ,,, be. Instead of wolf killing hearings, what are needed is planning and hearings on where livestock will be removed first in order to save those places from advancing cheatgrass. This ties into the broken Fire Policy, too. THe government spends millions, billions on “post-fire rehab” fire (building more cow fences, planting nice dense big flammable cow food grasses to help pepetuate and extend that cycle) – while applying those funds to buying out and permanently retiring public lands grazing permits is what should be done, instead. kt, I sincerely agree with everything that you say, with a few caveats. I am afraid 1) that, by identifying the conservation movement with a pure push for a wholesale end to public lands grazing, we will create a political weapon that will more effectively be used against us than on our behalf and 2) that, with money being concentrated internationally into fewer and fewer hands and a new feudalism on the rise, public lands, for the foreseeable future, need to remain too much of a chaotic battleground of competing voices to enable the true evil, the new oligarchs, to see them as an easy target for privatization. Wolf Creek could happen everywhere. Even now, these oligarchic, for lack of a better term, interests are well represented in the “holding entities” that do business associated with our public lands, from beef to wood to minerals; the street public just doesn’t see it because the use of various holding companies and equity firms shields so much from view nowadays. I fear that, if given the kind of federal deficit paralysis that the rightwing would love to orchestrate, the push to sell to these oligarchic interests would be strong indeed. I believe that pushing reforms in the way these lands are managed is our better bet. As a fellow political scientist, Ralph may see these factors; but, his postings are not clear on them. Frankly, I look back on November of 2000 as a horrible disaster that was unintentionally, but very foolishly, aided and abetted by those in the environmental movement who demanded an untenable level of purity and wouldn’t take anything less. Once the election was made close enough, through a splitting of our vote and it didn’t take much, fraud could be used to handle the rest. The perennial weakness of each far end of the spectrum, ours and fortunately theirs as well, is that both extreme ends want it all and they both want it now, which is a highly constrained tactical environment that only the extremely self-confident are foolhardy enough to be comfortable in. All seriousness aside, I have been very happy with the use of registered longhorns to meet my livestock requirements. They provided me with the required rationale to fence out the ORVs, although I still allow hikers through; they graze evenly and all across the range, without focusing on any one area or set of plants; their behavior, physical capabilities, and natural weaponry keeps me from having to worry about predators; and, raised on grass and genetically lean to begin with, they yield a product with better flavor and far lower fat and cholesterol. To add to this discussion, I would like to copy here a letter to the editor that appeared in this morning’s Casper (Wyoming) Star Tribune. The author is Debra L. Donahue, professor of law at the University of Wyoming Law School. Ms. Donahue is author of the book, The Western Range Revisited, which called for removal of cattle from the fragile public lands of the southwest. In retaliation for the publication of this book, a bill was introduced in the Wyoming legislature that would have abolished the Law School. The bill didn’t pass, but the message was sent; this sort of thing is typical for Wyoming. Luckily, Ms. Donahue had just received tenure, or she would have been in trouble. The university president at the time actively solicited comments from other (pro-livestock) professors at the university to criticize her argument and conclusions in public. Ms. Donahue also holds a MA in Wildlife Ecology and has worked at the BLM. She knows her stuff. The federal government — Bureau of Land Management in particular — bears major responsibility for the Milford fire and many others currently burning in the West. As the agency itself has admitted, the chief culprits are livestock grazing and weeds, especially cheatgrass. In a recent weed control Environmental Impact Statement, the BLM wrote: “Passive treatments, such as removing the cause of the disturbance (e.g., livestock …) may be more effective long-term than active treatments,” such as herbicides, brush removal, etc. Yet the agency refuses to alter its grazing policies. With every fire, range conditions get worse; eventually the damage is irreversible. Yet BLM perpetuates the degradation by permitting livestock to return. Cheatgrass will never be removed or even controlled unless it is replaced with native perennial vegetation. And that will not happen as long as livestock grazing continues. Livestock, particularly cattle, “preferentially graze native species” (BLM’s words). And “natural recovery … usually cannot occur unless grazing is completely discontinued” (Richard Stevens and Stephen Monsen, retired government scientists who edited a major report on restoring western ranges). The BLM could stop the “downward spiral of ecological conditions” on public lands (again, its words). It has the authority to stop livestock grazing where it is causing damage. In fact, as long as it continues to allow grazing, it is violating both the letter and the spirit of the laws it operates under. Here’s my response to “We have to keep ranchers supported in their welfare fiefdoms on our public lands”: When Bush called for the sell-off of public lands – was it two year’s ago? – There was public outrage — everywhere. Many people move to, and live in the West because of public lands recreation. The biggest sell-offs of public lands under Bush have come from the Nevada Wilderness Bills sponsored by Harry Reid – lubricated to passage because the legislated public land sell-offs in Lincoln and White Pine County were sugarcoated in a Wilderness package (along with the infamous Las Vegas water pipelines). Note: The floundering Owyhee Initiative would sell-off/give to ranchers as much as 75,000 acres – so it too would join this quid pro quo Wilderness Land Disposal pattern. Cattle grazing is destroying public lands across much of the West by fostering cheatgrass and other weeds. We have to get the cattle off – if anything is going to be left. If grazing continues to convert everything to cheatgrass – much if the Interior West will become a biological desert/void. And there won’t be any wildlife. Maybe a chukar or two. Time to acknowledge the dire situation that is upon us, and end the nightmare of predator killing, weed spreading, and paranoid provincialism surrounding public lands grazing. The federal government is going to be pouring massive amounts of our tax dollars into the aftermath of the 2007 fires – including millions to plant cow food and build “temporary” cow fences for $6000 or more an acre – all so that grazing can resume again in two years or less – and lock in a cheatgrass monoculture in perpetuity. Grazing afer only two growing seasons never allows time for native plant recovery and especially not for recovery of microbiotic crusts that protect soils from weeds. A rational, science-based post-2007 fires policy would be: Apply all those $$$ about to be spent to perpetuate grazing to END grazing … the primary ecological irritant that is priming lands to become cheatgrass Hells, and facilitating Global Warming processes. I could use suggestions on grass types & ordering sources. I’m trying to get grasses to grow on an old mine dump at 10,000 feet in Colorado. It is a small area (50 yard by 200 yards). I am fortunate to be able to apply some water using rather simple drip irrigation, which functions from mid-June to early September due to weather. I’ve used the mix of grass seed recommended by the Soil Conservation Service (ryes & brohmes as I recall). After 5 years of care I’m happy to see soil starting to form. I wonder if I should be finding some nitrogen fixers like lupine or fireweed (my small bunch of fireweed didn’t come back this year; not sure why). I’m a chemist by training, not a botanist. I could use recommendations of reading material.